The 25-year-old, who is out of contract at the end of the season, has been linked with a free transfer to Ibrox. But after speaking to Jack, McInnes reckon the reports are off the mark. 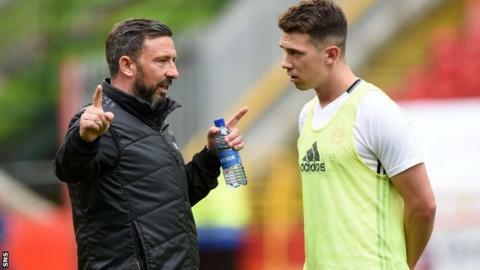 "He gave me assurances that there has been no contact, that he doesn't anticipate contact and that it's not something he's interested in," McInnes said on the club's twitter account. Club captain Jack has played almost 200 games for the Pittodrie outfit, who are currently second in the Premiership, nine points clear of third-placed Rangers. And McInnes remains hopeful the Scot will decide his future lies with the Dons. "I spoke to Ryan this morning as I normally do at training," the Aberdeen boss added. "Ryan feels that he is really happy here. He hasn't ruled out staying here and we're all hoping that he will be here next season. "But if he does decide to move on his likely destination will be England. He sees that maybe being his next opportunity if he decides to leave Aberdeen. "So there's absolutely nothing in it and you have to question the reason for it, whether it's to try and destabilise us or whatever. "I have been assured by Ryan - and I trust Ryan - that he nor his agent have had any contact with Rangers." Aberdeen face St Johnstone in Perth on Saturday, looking to bounce back from their 3-0 home defeat by Rangers on Sunday.